If you’re craving a sweet treat, be sure to stop at Froze Zone! We’ve got all sorts of frozen concoctions to please the whole family. Dig into a high-piled bowl of frozen yogurt with your favorite toppings. Or, if you’d like, take a little flavor trip to Italy as you indulge in our homemade gelato and Italian ice. There’s a lot to choose from, but you can always count on our friendly staff to help you make a decision. Froze Zone is a local business owned and run by Anthony Surabian. After graduating high school, Anthony began working in real estate. However, he didn’t feel rewarded by this work. When there was an empty pad at the entrance to Wachusett Plaza, the family’s business on route 12, the family started to considered options for what to do with it. Ice cream was an option, but there were already plenty of ice cream options in town. Yogurt was also a popular option. But Anthony wanted something a little different. Anthony’s Italian mother, when learning of his exciting endeavor, she suggested he add gelato into his plans! So Anthony learned to make gelato, not the frozen variety on supermarket shelves, but the fresh, flavor-rich variety more typically found on the streets of Italy. Anthony said he bought the necessary gelato-making equipment, a pricey investment, but worth every penny to make authentic gelato. But Anthony gambled that people would appreciate the intense flavor of gelato. The higher cost comes with better ingredients, and a little goes a long way. After one year of being open, Froze Zone’s most popular product was the gelato! Still, Anthony continued brainstorming about how he might sell more gelato. Then it hit him: What if he could make his business mobile? Anthony decided to take his gelato on the road! To accomplish this, he purchased a gelato cart capable of carrying five flavors and he began to book events, first starting small then working to larger events such as the Worcester Art Museum, The Hanover Theater, and the Nike Camp at Worcester State University. He called the business “Iovanni’s Gelato” after his mother’s maiden name. 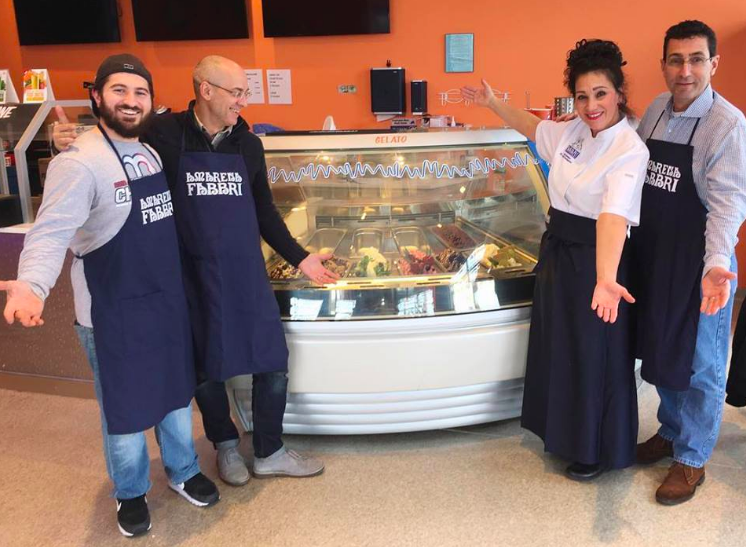 Now, Iovanni’s Gelato is Anthony’s mobile gelato catering service and Froze Zone is the retail location in West Boylston, for frozen yogurt, Italian ice, and homemade gelato!